Saskatchewan Party leadership candidate Scott Moe says he would reintroduce provincial sales tax exemptions on crop, life and health insurance if he is elected Saskatchewan Party leader and the province's next premier. Moe said he would pay for the promise with a workforce reduction through retirements and attrition in executive government and the Crown corporations. The five-per-cent reductions proposed by Moe are expected to save $70 million over two years, Moe said Oct. 3. The remaining $50.5 million needed to cover the $120.5 million cost of reintroducing the PST exemptions, which were eliminated in the government’s 2017-18 budget, would come from delaying the introduction of a proposed corporate income tax reduction, he said. “I think it’s important that as we look at any reduction in our public services such as this through attrition that, number one, people don’t lose their jobs — we do it through attrition and retirements — and number two, we don’t reduce our frontline services that people expect,” Moe said after making the announcement at a financial services firm in Saskatoon. Moe, who is backed by 22 Sask Party MLAs, including several prominent cabinet ministers, including Moosomin MLA and Minister of the Economy Steven Bonk, did not deviate from Premier Brad Wall’s plan to eliminate a $1.2-billion deficit and balance the budget by 2019-20. The Rosthern–Shellbrook MLA went on to defend his plan to introduce some of the PST exemptions cut in the government’s unpopular 2017-18 budget and not others, as well as his proposal to delay the introduction of a 0.5 per cent corporate income tax reduction for all sectors except manufacturing and processing. That does not constitute picking winners and losers, he said. 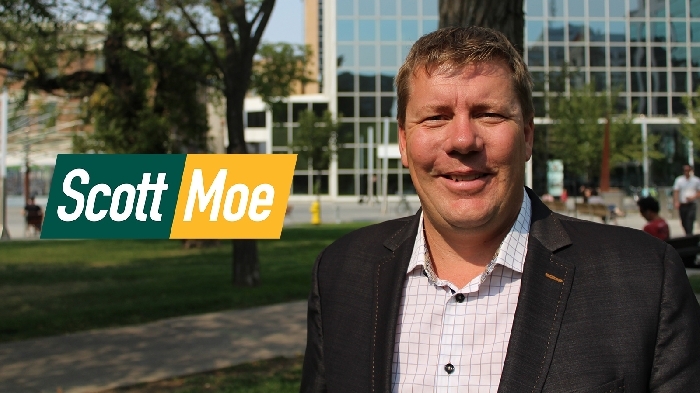 Moe is one of five candidates for the Sask Party leadership. The other candidates are former cabinet ministers Tina Beaudry-Mellor, Ken Cheveldayoff, Gord Wyant and former deputy minister to the premier Alanna Koch.